1. Call 410-810-4230 or e-mail captainmike@delmarvacharters.com to confirm that the sailboat you want is available on the dates you want to charter. 2. After we confirm availability, download an application form (see below) and e-mail the completed application form to us at captainmike@delmarvacharters.com. Please click here to get an application form. Click anywhere on the credit card images to Pay by credit card. 3. Then 50% of the total charter fee is then due payable by credit card or check. Once we receive your 50% payment, we will send you the completed charter agreement by e-mail or mail. If you pay by check, please make your check payable to Delmarva Charters and mail your check along with the completed application form to Delmarva Charters, 311 Society Place, Newtown, PA 18940. To pay by credit card please click on the credit card images below to pay via a secure site. 4. 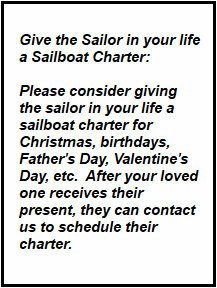 The remainder is due 60 days prior to the charter start date payable by check or credit card. Refund policy: If you cancel 60 days or more prior to the charter start date, then we will refund all of your money minus a $100 cancellation fee. No refund will be given if you cancel less than 60 days from the charter start date. If you sign up for a charter 60 days or less from the charter start date then full payment is due when you sign up for the charter.